OPELOUSAS, La. (AP) — The suspect in a string of fires that destroyed three black churches in rural Louisiana is the white son of a sheriff’s deputy whose father helped arrange for his arrest, authorities said Thursday. 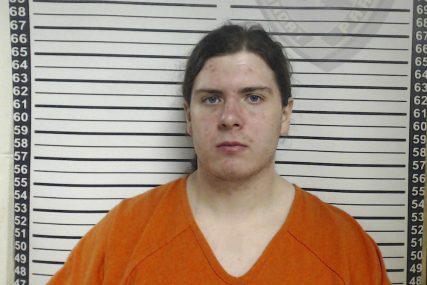 Holden Matthews, 21, faces arson charges in connection with the blazes in and around Opelousas, a city of 16,000 where the flame-gutted remains of the buildings evoked memories of civil rights era violence. Investigators used surveillance video, cellphone tracking and a Wal-Mart receipt to help identify Matthews, who was arrested late Wednesday. A red gas can recovered at one of the churches was sold at Wal-Mart locations, and the company’s investigators found that the same type of gas can, was bought March 25 at a store in Opelousas, along with automotive cloths and a lighter. In addition, cellphone tower data showed Matthews was in the area of all three fires. And surveillance video from businesses and homes near the churches, and on the roads to and from each fire scene, repeatedly showed a “light colored extended-cab truck” that was consistent with the beige pickup that belonged to Matthews’ father. Matthews apparently drove the truck to buy the gas can and other items, according to the court documents. The younger Matthews was arrested on three counts of simple arson of a religious building. A conviction could bring up to 15 years in prison on each count, Browning said. McGill reported from New Orleans and Opelousas, Louisiana. Associated Press writers Stacey Plaisance in Opelousas, and Michael Kunzelman in College Park, Maryland, contributed to this report.